I didn't realize I wasn't enjoying novels until recently when, after not enjoying yet another book that had been highly praised and/or recommended by friends, I asked myself what the last novel I actually enjoyed was. I had to think long and hard. The answer: Universal Harvester by John Darnielle, from February. (Before that, Garth Greenwell's What Belongs to You, December 2016.) Not that long ago, but given how many novels I read or tried to read after Darnielle's, it felt like a looooong time. Sickness can mess up any sense of time, and when you're book-sick, days feel like weeks, months, years. Anyway, that's all over now, at least for the moment. 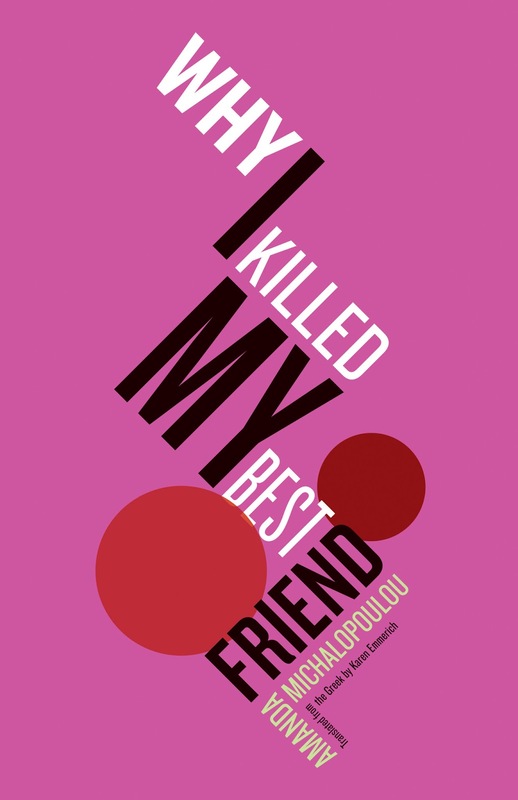 After tossing one book after another aside, I more or less randomly picked up Why I Killed My Best Friend by Amanda Michalopoulou, translated by Karen Emmerich. I liked the bright pinkish-purple cover and the title, so I thought I'd give the first few pages a shot. Reader, I hardly put the book down until I was done with it. It's not that I thought it was the greatest novel ever written. I enjoyed it, admired much of it, but like many books, its later chapters can't live up to the promise of the earlier. The elements that unambiguously worked, though, really appealed to that readerly pleasure center, whatever it may be, and that's what I want to outline here. The parts of the book that didn't work for me were the final two chapters, and I didn't realize quite how much they didn't work for me until I'd made my way through them and could reflect on the novel as a whole. And by "not work" I don't mean they were terrrible; there's much of interest in them, but the feeling of disappointment and even frustration was acute because everything leading up to those last 50 pages felt just about perfect. In a mediocre book, those final chapters could have been the best things about it, but this is not a mediocre book. Nonetheless, it was the energy and invention of the voice that drew me in, providing the delight that kept me reading Why I Killed My Best Friend to the final page. The way Michalopoulou (and Emmerich's translation) sets words, sentences, and paragraphs together expresses a certain kind of personality for the narrator, Maria. Individual sentences won't show the effect — I think here of Gertrude Stein: "Sentences are not emotional but paragraphs are" — and so the easiest way to illustrate the effect of the style is to point you toward this excerpt from the novel posted at PEN America. That excerpt is from early in the book, told from Maria's childhood point of view, when she was living with her parents in Nigeria and about to move to Greece (for reasons that won't really be known until the end of the novel). The perspective is that of a child, but the kind of associative leaps you see in those paragraphs are more or less common even to the adult chapters. One of the things that makes the book read so quickly (for me, at least) is the way so many of its paragraphs work like cuts in a film, sometimes to the point of montage. It's not always or entirely paratactic (which, cinematically, is more like a jump cut or smash cut), but there is a sense of transitions being reduced or skipped, and that sense is important for the pace of the novel as well as, ultimately, for its meaning. The other immediately-noticeable element is the present tense. Other writers would have chosen to vary the tense more, to place the chapters set in the past, for instance, against the chapters set in the narrative present via tense changes. Michalopoulou instead makes both narrative past and present immediate via the present tense. Again, this is for thematic purposes as well as aesthetic, which is one reason why it's such an effective technique for this story. Memories rush along as immediately as current experience. The narrative is structured to move more-or-less chronologically along two tracks: 1.) from Maria's childhood shortly before meeting the most consequential friend of her life, Anna; 2.) from Maria's life in her mid-30s, when she meets Anna again after having lost touch with her some years before. The earlier track moves quickly through many years, the later track is more focused. Mysteries propel the story: What caused the rift between Maria and Anna? How did Anna go from being a radical political activist to a bored housewife married to a rich architect? What exactly is Maria up to when she's not teaching after-school art classes for little kids? Ultimately, for me the disappointments of the novel's final two chapters don't overshadow its excellent qualities. In addition to the fine pacing and craft of the narrative voice, the use of politics sets Why I Killed My Best Friend apart from many novels with politically-engaged characters. Both Maria and Anna get involved with various radical political groups in Greece and France, and Michalopoulou is specific in the details of the groups and their lives: what they read, who their heroes are, what their causes believe, the nature of their actions (and inactions). We get a feeling for the everyday life of activism, but without obliterating a feeling for both the personal in the political and the personal separate from the political. It's a harder balancing act than it may seem, and, at least until the botched final chapters, Michalopoulou pulls it off as well as any other writer I've read. (A caveat: I know virtually nothing about Greek politics and history, and so much may have slipped by me.) If an aspiring writer were seeking to write something infused with, but not dominated by, political activism, this is one of the books I'd hand them to study, both for the excellence of the balance and for the perils of the final chapters, where the balance goes off the rails and Michalopoulou seems to have given in to a fear that the political activism hadn't made a big enough splash in the story.